Microsoft + GitHub = Empowering Developers - Before we can take a look at what's happened in Azure in the past week, be sure to check out this exciting news about an agreement for Microsoft to acquire GitHub. GitHub—home to more than 85 million code repositories—will retain its developer-first ethos, operate independently and remain an open platform. 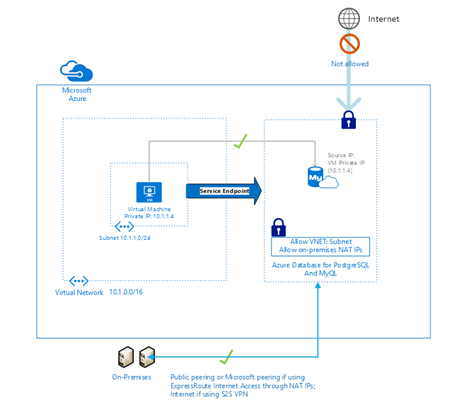 VNet service endpoints for Azure database services for MySQL and PostgreSQL in preview - You can use virtual network service endpoints to isolate connectivity to your logical server from only a subnet or a set of subnets within your virtual network. The traffic to Azure Database for MySQL and PostgreSQL from your virtual network always stays within the Azure backbone network. Preference for this direct route is over any specific routes that take internet traffic through virtual appliances or on-premises. Receiving and handling HTTP requests anywhere with the Azure Relay - Azure Relay is a part of the messaging services family along with Azure Service Bus, Azure Event Hubs, and Azure Event Grid. It provides the "networking magic" that enables the Visual Studio Live Share. Relay now also supports relayed HTTP requests in preview, which is very interesting for applications or application components that run inside of containers and where it's difficult to provide a public endpoint, and is especially well-suited for implementing Webhooks that can be integrated with Azure Event Grid. Azure Security Center can identify attacks targeting Azure App Service applications - At RSA, we announced that Azure Security Center leverages the scale of the cloud to identify attacks targeting App Service applications. Security Center threat detection analyzes App Service internal logs to identify attack methodology on multiple targets. A public preview of this feature is available now on the Standard and Trial tiers of Security Center at no additional cost. Soft delete for Azure Storage Blobs generally available - Soft delete for Azure Storage blobs has entered general availability. The feature is available in all regions for public, government, and sovereign cloud. When you turn on soft delete, you can save and recover your data when blobs or blob snapshots are deleted. This protection extends to blob data that's erased as the result of an overwrite. Combining Azure scheduled events and Event Grid - Corey Sanders, Corporate VP - Microsoft Azure Compute team sat down with Ziv Rafalovich, Principal PM on the Azure Compute Team to talk about scheduled events (now GA) combined with the power of Event Grid for notifications. The IoT Show | COPA-DATA tells us about integrating IoT solutions in manufacturing and public sector - Bringing an IoT solution to production in a specific industry requires a deep understanding of both the said industry as well as Cloud and devices technologies. In addition, a high degree of digitization of companies' processes is necessary. Johannes Petrowisch from our elite partner COPA-DATA came on the IoT Show to share their experience working with customers in manufacturing and public sector integrating Azure IoT technologies in combination with their industrial software platform zenon. The IoT Show | Azure IoT Hub automatic device configuration - Device Management is complex, especially so for Internet of Things solutions considering the variety and heterogenous nature of IoT devices. Building on top of Device Twins and Device Direct Methods primitives, the new Automatic Device Configuration feature of IoT Hub paves the way toward a simple way to configure IoT devices at scale from the comfort of Azure. Chris Green, PM in the Azure IoT team shows us the new feature recently announced. Digging in with Azure IoT: Our interactive developer guide - The Azure IoT developer guide takes you through things, insights, and actions, mapping Azure IoT services to each level of IoT, and then provides a step-by-step plan for experimenting with live IoT capabilities using languages and tools of your choice. Read this guide to learn about the IoT Application pattern and a framework for thinking about IoT application architectures. Make Azure IoT Hub C SDK work on tiny devices! - Azure IoT Hub C SDK is written in ANSI C (C99), which makes it well-suited for a variety of platforms with small disk and memory footprint. We recommend at least 64KB of RAM, but the exact memory footprint depends on the protocol used, the number of connections opened, as well as the platform targeted. This blog post walks through how to optimize the Azure IoT Hub C SDK for constrained devices. 3 reasons why Azure’s infrastructure is secure - Appropriately enough, this is the third post in a four-part series on how Microsoft Azure provides a secure foundation. This blog post discusses the network infrastructure, firmware and hardware, and continuous testing and monitoring that make up Azure’s secure infrastructure. It also covers some of the security services you can use to further secure your network. How I choose which services to use in Azure - In this blog post, Microsoft MVP Barry Luijbregts outlines his thought process on how he selects which Azure services and capabilities to use for his own projects, and when he consults for his clients. It also includes an episode of Azure Friday with Scott Hanselman, which provides a discussion on this topic. AI Show | Azure Custom Vision: How to Train and Identify Unique Designs or Image Content - Ruth shows how to use Azure Custom Vision to train a model to recognize a modern Mercedes-Benz car keys since the design does not look like a traditional key. Then shows to how to call the generated REST API from the trained model in a Java application that displays tags and description of uploaded images. Gain application insights for Big Data solutions using Unravel data on Azure HDInsight - This post announces Unravel on Azure HDInsight Application Platform. Azure HDInsight is a fully-managed open-source big data analytics service for enterprises. Unravel provides comprehensive application performance management (APM) for these scenarios and more. Check out this post to register for a webinar on June 13 for how to build fast and reliable big data apps on Azure while keeping cloud expenses within your budget. Getting started with Apache Spark on Azure Databricks - Attend this on-demand webinar to learn how to get started with Apache Spark on Azure Databricks. Designed in collaboration with the original founders of Apache® Spark™, Azure Databricks combines the best of Databricks and Microsoft Azure to help customers accelerate innovation with streamlined workflows, an interactive workspace and one-click set up. Azure Databricks is an analytics engine built for large scale data processing that enables collaboration between data scientists, data engineers and business analysts. The best of AppSource & Azure Marketplace at Build 2018 - This post highlights key sessions from Build 2018 that address the new features, functionality and services that we recently announced for Azure Marketplace. The Azure Podcast: Episode 231 - IaaS VM options - Cynthia, Cale and Sujit chat about the plethora of IaaS VMs available and things to watch for when selecting the right VM SKU/Size. Kubernetes objects on Microsoft Azure - Consider this ebook a jumping off point for Kubernetes development projects on Azure. Mahesh Kshirsagar of the Azure Customer Advisory Team (AzureCAT) introduces Kubernetes objects for Azure deployments. This ebook demystifies Kubernetes by focusing on a real-life scenario in which a basic tiered application is deployed using pods and controllers. Mahesh walks you through the steps to deploy a simple application with a web front end running ASP.NET Core 1.0 and a back end with a SQL Server container running on Linux. Scripts and guidance are available in the accompanying GitHub repository. Container Native Development with Ralph Squillace - Ralph Squillace is a principal program manager with Microsoft, where he works on containers, Linux, and cloud products. Ralph joins the Software Engineering Daily podcast to talk about how developing with containers has changed in the last few years, and how it will continue to evolve in the near future. Docker extension for working with Docker in Visual Studio Code - Docker is a very popular container platform that lets you easily package, deploy, and consume applications and services. Whether you are a seasoned Docker developer or just getting started, Visual Studio Code makes it easy to author Dockerfile and docker-compose.yml files in your workspace. VS Code even supports generating and adding the appropriate Docker files based on your project type. Tutorial: Deploy to Azure using Docker - This tutorial walks you through containerizing an existing Node.js application using Docker, pushing the app image to a Docker registry, then deploying the image to Azure Web App for Containers directly from Visual Studio Code. Containerized Docker Application Lifecycle with Microsoft Platform and Tools - This guide provides end-to-end guidance on the Docker application development lifecycle with Microsoft tools and services while providing an introduction to Docker development concepts for readers who might be new to the Docker ecosystem. This enables anyone to understand the global picture and start planning development projects based on Docker and Microsoft technologies/cloud. Azure Friday | Episode 436 - Deploying Node.js Applications from VS Code to Kubernetes - Brendan Burns joins Donovan Brown to discuss how you can quickly and easily build a containerized Node.js app on Linux and deploy it to Azure Kubernetes Service using Visual Studio Code and the Visual Studio Code Kubernetes Extension. Azure This Week - 1 June 2018 - In this episode of Azure This Week, James takes a look at the public preview of Azure AD authentication for Azure Storage accounts, Data-In Replication for Azure Database for MySQL and how you can start building a serverless, event-driven framework for responding to scheduled Azure maintenance.